Through a major collaboration with Greenbone Networks, NNT has advanced their security through system integrity strategy with distributed, fast and accurate Enterprise-Class vulnerability scanning. NNT Vulnerability Tracker is based on the commercial-grade version of OpenVAS, the world’s most widely adopted vulnerability assessment tool. 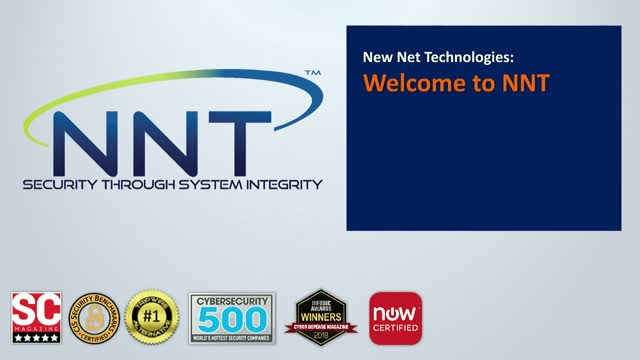 This forms a significant progression of NNT’s SecureOps Enterprise Security Strategy and complements NNT’s award-winning Change Tracker Gen7R2 to further efforts in solving IT Security through the definition and delivery of Integrity. NNT’s Vulnerability Tracker™ identifies known vulnerabilities within software and configuration settings before they can be exploited by a cyber-attack. Vulnerability Tracker continuously tests and assesses your IT network and any device connected to it against more than 66k Network Vulnerability Tests (NVTs) with new vulnerabilities are added daily. With Vulnerability Tracker, you will be able to identify and reduce the attack surface giving you better control and assurance that your infrastructure is operating with the least amount of risk. Register now to learn more about Vulnerability Tracker’s unique ability to deliver a comprehensive security solution that aligns with your security strategy to mitigate your overall security risk. NNT’s newly released Change Tracker Gen7R2 solves IT Security and the problems that plague all organizations – the overwhelming noise of change control and ensuring the integrity of IT systems. Completely redesigned with both security and IT operations in mind, Change Tracker Gen7R2 is the only solution designed to reduce chance noise and the complexity of integrity monitoring and policy management all while allowing for unprecedented scalability and management that meets the most demanding enterprise environments. With Gen7R2’s integration and automation with ITSM platforms such as ServiceNow®, change noise is reduced by more than 90%, leaving only changes that are unknown unwanted, unexpected, or malicious in nature. Register now to learn more about NNT’s newly released Change Tracker Gen7R2 and how comprehensive and effective our SecureOps strategy can be to achieving operational excellence. Change Tracker Gen7 has been completely re-designed and improved to more effectively deliver automated, key foundational security controls, encompassing System Integrity Monitoring, Vulnerability Management, Malware Protection and Change Control. Change Tracker Gen7R2 delivers a breath-taking range of new innovations to target and solve key cybersecurity issues. Best of all, Gen7R2 elevates system integrity monitoring to new levels of forensic visibility and change control, but also solves the issue of alert fatigue that previously blunted the power of traditional file integrity monitoring systems. Our latest self-learning breach detection technology utilizes pattern matching intelligence to identify expected, planned changes, against changes that could represent a breach. Gen7R2 leverages contextual change control underpinned by the world’s largest authoritative file whitelist, enabling organizations to spot breach activity in real-time and act before any serious damage is done. The security industry as we know it is broken and the problem is getting worse. We now must look at security through a different set of spectacles. Ones that allow us to manage more by fact and not fiction. Simply put…there are no silver bullets to solve this problem! We have to stop following bright shiny objects and get back to “Basics”. This webinar is the first in a series delivered by the Center for Internet Security (CIS) and NNT intended to help educate and articulate how security and operations need to leverage one another to achieve common IT goals. The content of this webinar will provide very specific data points about a SecureOps strategy and the benefits from such an approach. More importantly, it will articulate a framework that prioritizes IT controls that begin to move from descriptive to one that is prescriptive and is prioritized based on risk mitigation and overall defensible effectiveness. Register now and get a free copy of the new SANS Security Leadership Poster and a fully-functional extended trial of NNT Change Tracker Gen7 to see how easily you can embrace SecureOps in your environment. For the first time ever, ServiceNow customers are able to reconcile changes that occur with the IT environment with the actual changes approved in ServiceNow. NNT has integrated its award-winning Change Tracker Gen7™ with ServiceNow's service management tool to enable a closed-loop environment for change management. This integration provides zero tolerance to changes –leaving no place to hide for unwanted changes or breach activity. To further help reduce change noise, NNT Change Tracker leverages the worlds largest whitelisting service to automatically analyze changes in real-time using NNT's File Assured Safe Technology (FAST). See how NNT Change Tracker Gen 7 ™ delivers "closed loop" SecureOps, reconciling all actual changes made with ServiceNow® change requests. Most organizations today run a ‘Build-a-Bear’ approach to Cyber Security, with products and practices they piece together. If you aren’t already subject to one or more specific GRC mandates, inevitably, one will soon be dropped on you. Regardless of the regulation, you will need to provide structured evidence proving you operate in compliance with a fit-for-purpose set of controls. Just in the last 12 months, GDPR and NIST 800-171 have been made mandatory. This, coupled with the stats telling us that security breaches are increasing despite year on year increases in security investment, tells us that the need to understand and implement security controls is inevitable. What is the most strategic, long-term and resource-effective way to reconcile increased demands for compliance and security? How do you bring together the aligned but segregated needs for ITSM and Security? How do you elevate traditional change management to the state of the art of change control, providing security-grade change visibility but without compromising your organizations’ IT agility? Get a free copy of the integrated Secure Controls Framework playbook and a fully-functional extended trial of NNT Change Tracker to see how easily you can embrace SecureOps in your environment. NNT is the leading provider of Security through System Integrity focused on helping organizations reduce their security risk, increase service availability and achieving continuous compliance.